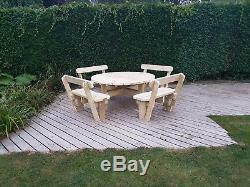 Heavy Duty Round 8-Seater Garden Picnic Table/Bench (1.6m) with Back Rest (Fully Treated). 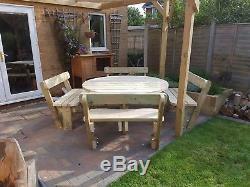 Custom-built, solid, hard wearing and heavy duty garden furniture. Our own design, we incorporate comfortable back rests into the benches, for further comfort and relaxing. And because of the wood we use, these are designed for longevity. All of our bespoke furniture is designed for you. Each of our pieces is made to order and can be tailored to your needs. All of our garden furniture is built using FSC-certified quality treated constructional grade 2 inch/47mm thick timber only. This timber produces a neater faster finish for all construction projects. There's no pallet wood and seconds used in our builds. There's no visible screws to any of the surfaces and all load points are fixed with coach bolts. The coach bolts are capped for protection. All edges and corners are sanded for safety and to avoid splintering. All cut ends are treated with End Grain Preserver. The table itself is 1.6m diameter. (but can be designed to your exact requirements to accommodate your available space if required). The table size is perfect for family gatherings and hosting parties, giving you ample space for entertaining. The overall footprint width is approximately 240cm square. The item "Heavy Duty Round Garden Picnic Table/Bench (1.6m) with Back Rests Fully Treated" is in sale since Wednesday, November 22, 2017. This item is in the category "Garden & Patio\Garden & Patio Furniture\Garden & Patio Furniture Sets". The seller is "u-wood" and is located in March. This item can't be shipped, the buyer must pick up the item.